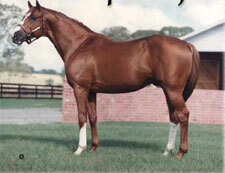 Pedigree Query • View topic - where did this paint/sabino color come from in his pedigree? Post subject: where did this paint/sabino color come from in his pedigree? there is a picture of him in the above link. He is chestnut with white socks above knees and hocks,white belly spots on both left and right sides,and a big blaze with chin white.